Please refer to our stock # fd2 when inquiring. This amazing unsigned necklace and earrings set is actually a design first rendered by Taxco maestro, Fred Davis. It is 6 3/4" long x 1" wide and the screwback earrings are 1 3/4" long x 1/2" wide. 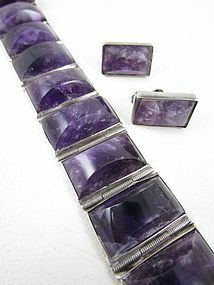 The bracelet has 10 panels with arch shaped amethyst stones which are faceted on each side. The set is in excellent condition and the bracelet is marked "Sterling Mexico" while the earrings bear no hallmarks.